Rowan Big Wool 100g 100% merino wool. A pure merino, super chunky wool. Knits on a 15mm needle so immediate results are guaranteed. Rowan Cashmere A soft cashmere yarn made of 95% cashmere and 5% wool. To have the perfect cashmere softness we recommend washing your garment before wearing, because then it becomes even softer. It is ideal for all kinds of baby & womens wear. Machine wash 30 deg. Rowan Cashmere Tweed A premium tweed yarn. With its exclusive material composition of virgin wool and cashmere, this yarn is perfect for luxurious, soft garments with the classic tweed look. 80% Virgin Wool, 20% Cashmere. Hand wash normal. Rowan Fine Tweed The finer version of Rowan Tweed, perfect for fairisle and colour work, this lovely Yorkshire made 4 ply weight yarn is available in rich and rustic shades. 100% wool. Hand wash normal. Rowan Moordale NEW YARN!A truly British yarn. A blend of the finest British Wool and British Alpaca. Moordale is made using fine micron wool of the Bluefaced Leicester which is known for being both soft and strong. Blended with Alpaca to add a lustrous, silky touch, Moordale is a natural, robust, tender yarn which drapes well and feels comfortable on the skin. 70% Wool 30% Alpaca. Hand wash warm. Rowan Tweed A beautiful soft, traditionally spun tweed yarn made in one of the few surviving mills in Yorkshire. This DK weight 100% wool yarn is available in rich and rustic shades. Hand wash normal. Rowan Tweed Aran Rowan Tweed Aran is a beautiful soft, traditionally spun tweed yarn made in one of the few surviving mills in Yorkshire. Hand wash, normal. 100% Wool. Rowan Drift SALE 50% OFF! A wonderfully soft roving yarn which is knitted on the same needle size range as Big Wool. Available in tweedy mélange shades, Drift is set to become as popular as Big Wool. 100% Merino wool. Latest Patterns 8 or 15 mm/000 UK/15-19 US 7½-9 sts x 10-12½ rows Approximately 80 metres (87 yards) per 100g ball. Hand wash cold. Rowan Purelife British Sheep Breeds Boucle Lovely, sumptuous and comforting yarn adds a warm and cosy feel to the British Sheep Breeds range. 100% British wool. Latest Patterns 8 mm/0 UK/11 US 8½ sts x 13 rows Approximately 60 metres (66 yards) per 100g ball. Hand wash warm. 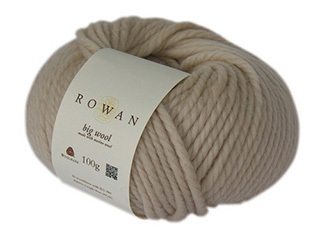 Rowan Purelife British Sheep Breeds Chunky - Undyed Beautiful undyed yarn. Annually renewable, blended from British sheep. 100% British wool. Latest Patterns 7 mm/2 UK/10½-11 US 13 sts x 18 rows Approximately 110 metres (120 yards) per 100g ball. Hand wash warm. Rowan Purelife Organic Wool Naturally Dyed Organic wool, naturally dyed from plant dyes. 100% organic wool. Latest Patterns 4 mm/8 UK/6 US 22 sts x 30 rows Approximately 125 metres (137 yards) per 50g ball. Hand wash (30 deg C) in pH neutral detergent. Rowan Pure Wool 4 Ply A robust, hard wearing yet soft 100% wool yarn. It is machine washable and therefore lends itself perfectly for knits for all the family. 100% Super wash wool. Latest Patterns 3.25 mm/10 UK/3 US 28 sts x 36 rows Approximately 160 metres (176 yards) per 50g ball. Machine washable. Rowan Pure Wool Aran 100% wool. 4½-5 mm/7-6 UK/7-8 US 17-19 sts x 23-25 rows Approximately 170 metres (186 yards) per 100g ball. Machine washable (40 deg). Rowan Pure Wool DK SALE 10% OFF! A robust, hard wearing yet soft 100% wool yarn. It is machine washable and therefore lends itself perfectly for knits for all the family. 100% super wash wool. Latest Patterns 4 mm/8 UK/6 US 22 sts x 30 rows Approximately 125 metres (137 yards) per 50g ball. Machine washable (40 deg). Rowan Pure Wool Superwash DK 100% Superwash Merino Wool, hard wearing yet soft to touch making this yarn ideal for all the family and is perfect for homeware projects. Available in 22 shades of the original Pure Wool DK with the addition of 10 brand new heather shades developed specifically for this new yarn. Machine wash 40 deg. Rowan Pure Wool Superwash Worsted Soft 100% Wool, machine washable worsted weight yarn, available in 50 lovely shades ranging from soft neutrals to mid tone brights and deep darks. Knits to the same tension as Creative Focus Worsted. 100% super wash wool. Latest Patterns 4½ mm/7 UK/7 US 20 sts x 25 rows 200 metres (219 yards) per 100g ball. Machine washable (40 deg). Rowan Softest Merino Wool Super soft chunky roving yarn made of 100% extrafine merino wool, ideal for all kind of cocooning knitwear. Hand wash only..
100% Wool made with high quality extra fine merino. Merino has a natural elastic quality allowing for movement when wearing. It is also ‘breathable’ so warm when the weather is cold, and cool when the weather is hot. The knitted fabric is soft and smooth and is a great core yarn with. Available in 4ply, perfect for babies and toddlers, DK and Aran. Machine wash 40 deg. Rowan Super Fine Merino Aran 100% Wool made with high quality extra fine merino. Merino has a natural elastic quality allowing for movement when wearing. It is also ‘breathable’ so warm when the weather is cold, and cool when the weather is hot. The knitted fabric is soft and smooth and is a great core yarn with a large shade range and is available in 4ply, DK and Aran. Machine wash 40 deg. Rowan Super Fine Merino DK 100% Wool made with high quality extra fine merino. Merino has a natural elastic quality allowing for movement when wearing. It is also ‘breathable’ so warm when the weather is cold, and cool when the weather is hot. The knitted fabric is soft and smooth and is a great core yarn with a large shade range and is available in 4ply, DK and Aran. Machine wash 40 deg. Rowan Thick 'n' Thin SALE 31% OFF! A beautifully textured yarn for chunky knit stitches, such as ribbing, cabling and weave textures. 100% wool. Hand wash cold. Rowan Valley Tweed This yarn is spun and dyed in the heart of Yorkshire, the home of Rowan. Valley Tweed is made by using the spinning method traditional for tweed yarns and is therefore very airy and light and has a long meterage. A subtle colour effect is created by using an additional thread of lambswool. 100% wool. Hand wash normal.